Daytime TV had a range of responses to Chen's exit from The Talk. "I think it would be hard to be on that show and if you couldn't share so I sorta understood," Hoda Kotb said on Today. "She'll be missed on that show," Gayle King, Chen's colleague, said on CBS This Morning. On The View, Whoopi Goldberg wished Chen well, while Abby Huntsman said: "What I would love for her to do is to use that as an opportunity to be transparent, to be real, to talk to people about what maybe she's been through." Kathie Lee Gifford expressed sympathy for Chen on the 10am. Today show. "It always bugs me when they say the humiliated so-and-so. I'm capable of humiliating myself…She's not humiliated," said Gifford. "She's heartbroken. There's a big difference. You know what I'm saying?" 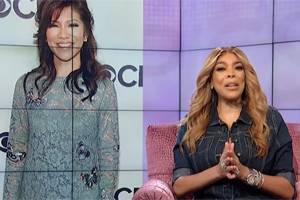 Meanwhile, Wendy Williams questioned Chen's teary goodbye: "It's nice to know she watches 'Hot Topics,' where I said she should quit because she is a distraction," Wendy said. "She ended up crying towards the end but in my mind, those weren't tears because of the crew. In my opinion, she wasn't crying because of the cast and the crew and the staff and stuff. She was crying because now she has to go back to that compound and deal with that man and try to keep her son out of it. And there is no compound to me that is big enough." ALSO: Chen taped tonight's Big Brother episode on Tuesday, the same day she announced her Talk departure.